The construction of the original stadium is attributed to the statesman and orator Lykourgos, at 329 B.C. The ground belonged to an Athenian citizen by the name of Deinias, who ceded it to the city for the construction of an arena, as well as an amphitheater for the Panathenaea games and festivities on the southeast edge of ancient Athens, beside the river Ilissos and outside the city walls. Large-scale construction works were required in order to create the necessary grounds in the natural hollow between the hill of Ardettos and the hill of Agras to the North. The first Stadium, as all ancient Greek stadiums, was a simple structure which included the Dromos, or track area, and the right-angled stadium with seats of stone for the spectators. The length of the dromos is about 600 Greek feet, or 178 meters, which would make it a real stadion since this exact length was used for the races. The track was leveled between two long declivities opened at the North, from the side of the entrance; the latter was ornamented with majestic propylaea. 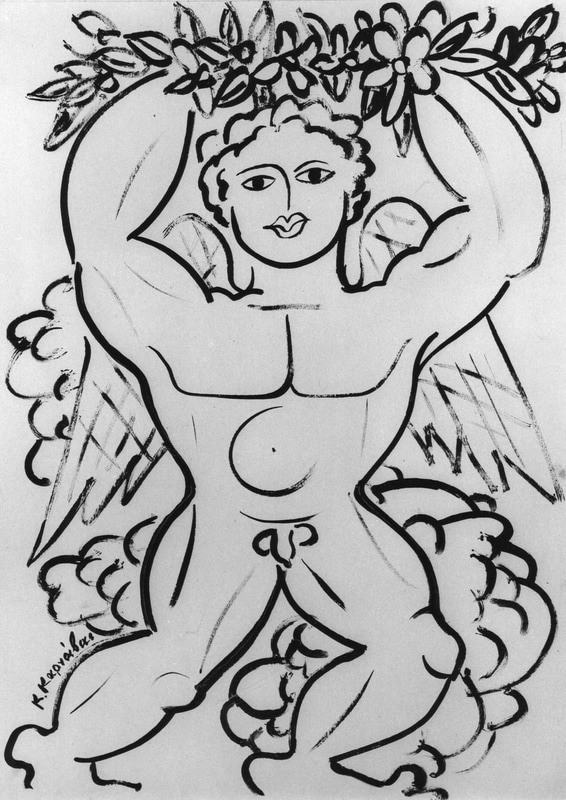 The track itself was marked with double faced pillars called hermai (from God Hermes), four of which have been found. 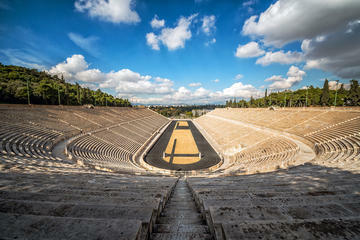 From this time on, the renowned athletic competitions were held here during the Great Panathenaea. 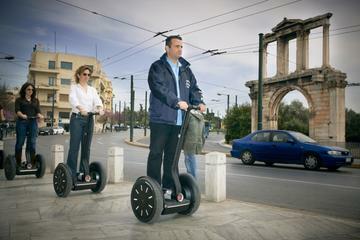 These contests had previously been staged in the Ancient Agora along the length of the Panathenaic Way. The Panathenaic Stadium at 1896. The Panathenaic Stadium acquired fame, however, following its reconstruction by Herod Atticus in the 2nd c. A.D. between the Panathenaic festivals of 139/140 and 143/144 A.D. It was constructed entirely of white marble from Mt. Penteli, in the style of a Roman stadium with a semicircular sphendone, slightly curved sides, and with rows of seating for 50,000 spectators, divided by a diazoma aisle. Marble pillars in the form of herms marked the start and finish of the Stadium and there was an underground crypt beneath the hill. The stadium was particularly impressive for its size and marble construction, where it gets the name kallimarmaron from. Philostratos writes that the Stadium surpassed all marvels since no other theater can rival it; Pausanias refers to it as a marvel, and impressed by its marble records that almost all the marble of Mt. Penteli must have been used in its construction. The triple-arched bridge over the Ilissos in front of the Stadium and the Temple of Tyche on the hill of Ardettos complete the architectural picture of the ancient stadium. It was there, above the stadium, on the eastern hill, that Herod Atticus was buried in 1798 A.D. The following epigram was engraved on his tomb" "Marathonius Herodes Atticus, whose works these are / lies here buried, worthy in all things". In late-Roman times, the Stadium was transformed into an arena for gladiators and wild beasts. The exact date of its destruction is not known. However, lime-kilns have been found in the area of the stadium and there can be no doubt that much of the marble was turned into lime. Very little marble was still visible at the time of the Greek Revolution, in 1821. On April 6th, 1896, the first modern Olympic Games were revived at the Panathenaic Stadium in Athens! During the first games only 280 participants representing 13 nations competed across 43 events, covering track-and-field, swimming, gymnastics, cycling, wrestling, weightlifting, fencing, shooting, and tennis. America’s James Connolly became the first modern Olympic champion when he won the triple jump on the opening day of the Games an achievement for which he was awarded a silver medal and an olive branch. France, Great Britain, Germany and Greece had the largest number of athletes participating. ​All told, America placed first, second or third in 20 events while Greece scored in 46 events and Germany placed in 13 competitions. To the delight of the locals, Greek runner Spyros Louis, a water delivery boy, won the marathon. All the competitors were men, and a few of the entrants were tourists who stumbled upon the Games and were allowed to sign up! Runners at the 1896 Olympic Games, at the Panathenaic Olympic Stadium. Runners at the Panathenaic Olympic Stadium. A jacaranda tree trying to hide among other trees on Ardittos Hill by the Panathenaic Olympic Stadium of Athens. Get the background on what the Olympics were really about, in venues connected to the real Olympic events. Find out more about how ancient Olympic athletes trained, and learn some techniques used by modern athletes, before you compete in a race in the world’s first modern Olympic Stadium. This is a 2-hour, small-group activity, for no more than 12 guests. 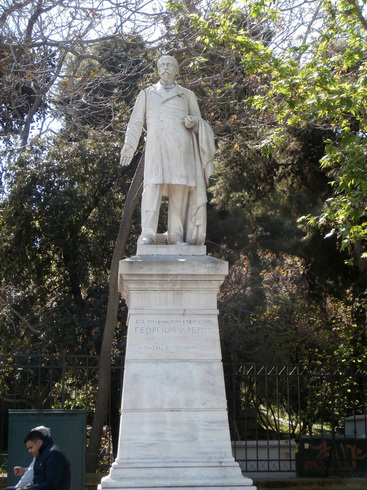 The statue of Georgios Averoff by Georgios Vroutos. During the dark times when Greece, was occupied by the Turks, the stadium was stripped of most marble and all ornaments. At around 1856, after the liberation of Greece, Evangelis Zappas, the benefactor, raised the issue of the renovation of the historic site. In 1874, and in order to host a first attempt for the revival of the Olympic Games in the following year, a bridge was built over Ilissos River, and improvements were made in the track and field areas of the stadium. ​In 1895 and through 1900, the marble seating restoration, funded by yet another benefactor, Georgios Averoff, was greatly improved so that the 1st Olympic Games of 1896 could take place. In antiquity, athletic competitions such as racing, boxing, jumping, javelin-throwing, chariot and horse racing, had taken place in the stadion. These games were celebrated every year during the great Panathenaea, in the month of Hecatomveon, about the end of July. Then in the midst of unparalleled splendor, 300 oxen were drawn for sacrifice before the altar of the goddess. 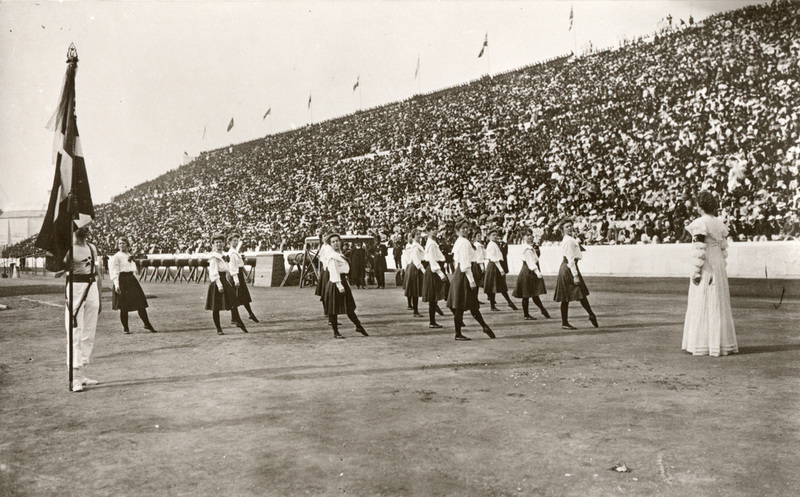 Callisthenics at the Opening Ceremony of the 1896 Olympic Games at the Panathenaic Olympic Stadium. 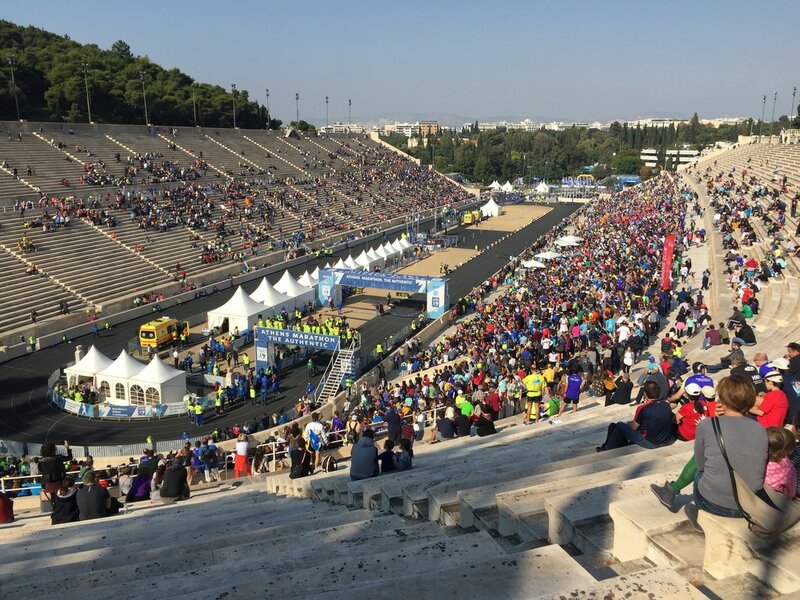 The Finish of a Marathon Run at the Panathenaic Olympic Stadium. As close as 200 m. from the Panathenaic Olympic Stadium of Athens, and 600 m. from the Museum of Cycladic Art, we will recommend Pi Athens Hotel, rated as "superb" by guests of Booking.com. All guests benefit from discounted rates at Holmes Place Health Club nearby with access to the swimming pool, the sauna, the hamam and the gym. Guests can enjoy the on-site bar. Each room includes Cocomat mattresses and a flat-screen TV with satellite channels, and free Wi-Fi. Some units have a seating area for your convenience. You will also find a kettle in the room. For your comfort, you will find free toiletries, a hairdryer and a kettle for your tea or coffee.